Public charter schools were authorized by the Texas Legislature in 1995 to provide more choice and options in public education. Charters must adhere to the same state academic and financial accountability standards as all other public schools, but are granted some flexibility in staffing and instruction. Senate Bill 2 gradually raises the arbitrary cap on charter schools in Texas from 215 in 2013 to 305 in 2019. 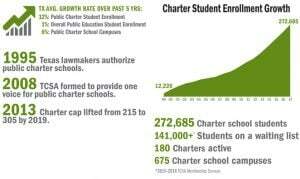 In September 2014, under SB2 the first 10 additional charters were added. In the state of Texas, charter schools operate under and receive academic accountability ratings from the Texas Education Agency. Both charter and traditional public school students in Texas take the State of Texas Assessments of Academic Readiness (STAAR™) tests. Enrollment in Texas charter schools continues to increase as more families want the best-fit school for their students. In 2016-17 there were 272,685 students in 675 charter campuses. There were more than 141,000 students on wait lists to attend a public charter school.